Wu Yuxiang (Wu Yu-hsiang - 1812 to 1880) is the originator of Wu (Hao) Style Taijiquan and author of Exposition of Insights Into the Practice of the Thirteen Postures, (also called “The Mental Elucidation of the Thirteen Postures”), one of the most important of the Taijiquan Classics. 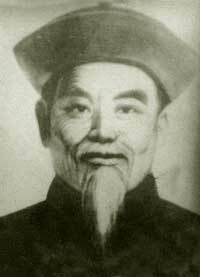 Born into a wealthy and politically influential family, Wu and his two brothers, beginning in 1849, studied with Yang Luchan, the founder of Yang Style taijiquan. Wu also studied with Chen Qingping, a 7th generation master of the Chen Family for forty days in 1852. That same year he received a copy of the Taijiquan Treatise attributed to Wang Zongyue. (This text is also an important Taijiquan Classic.) He began teaching his nephew Li Yiyu in 1853, who would become his most famous student..
Douglas Wile. "Lost T'ai-chi Classics from the Late Ching Dynasty. . State University of New York, 1996. [ This link, beginning on page 16, contains extensive biographical-historical information on Wu Yuxiang, and the Wu family].